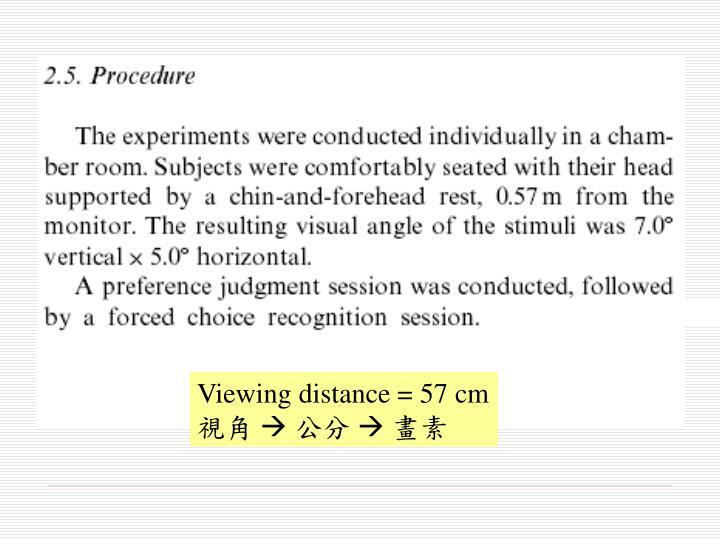 研究方法與實例簡介. 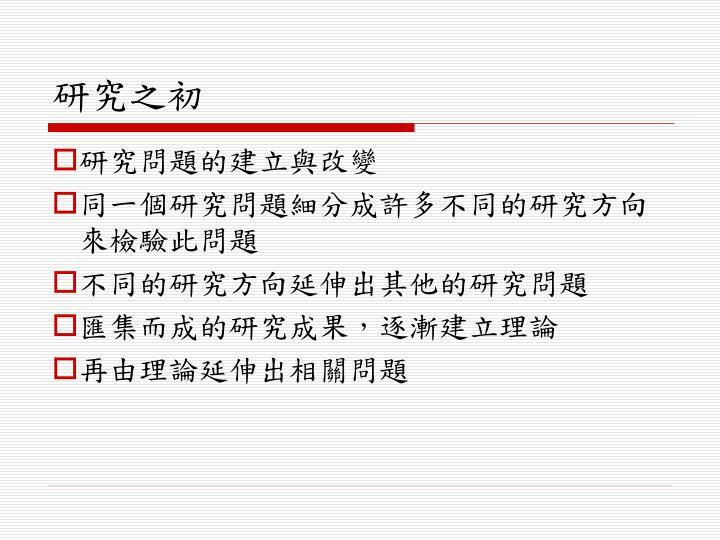 中山醫學大學 心理系 何明洲 如要採用，請告知作者，並註明出處. 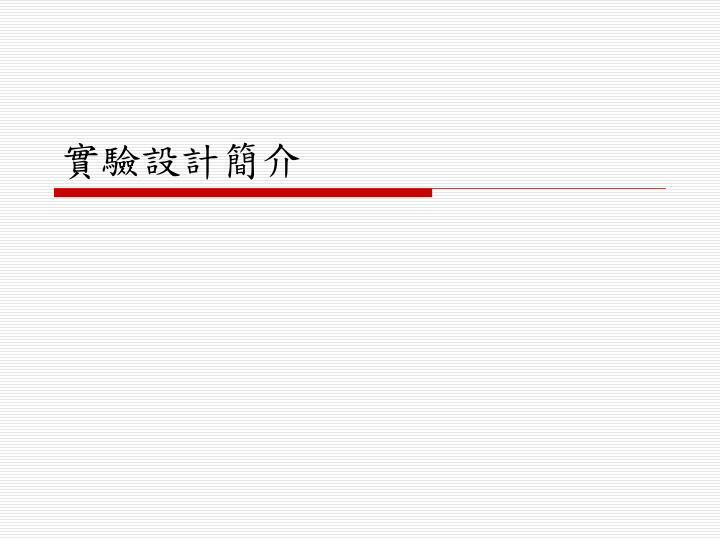 大綱. 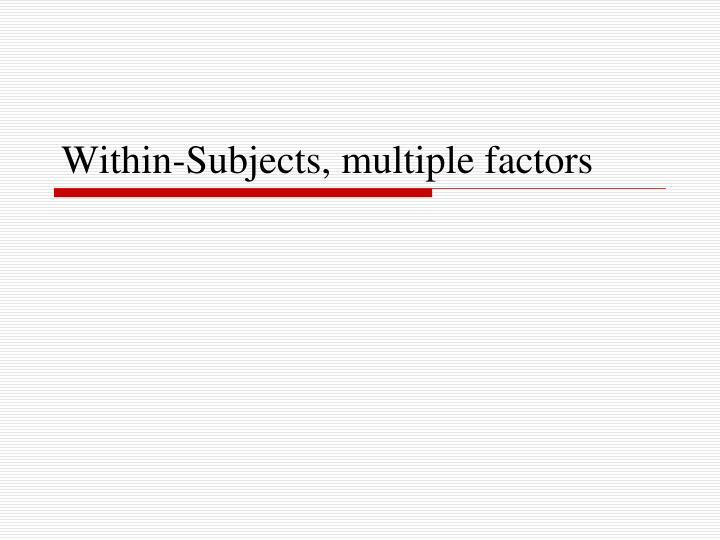 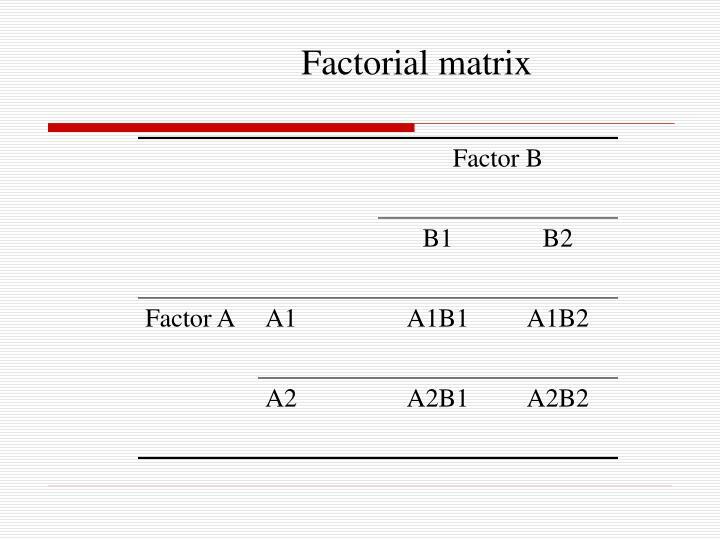 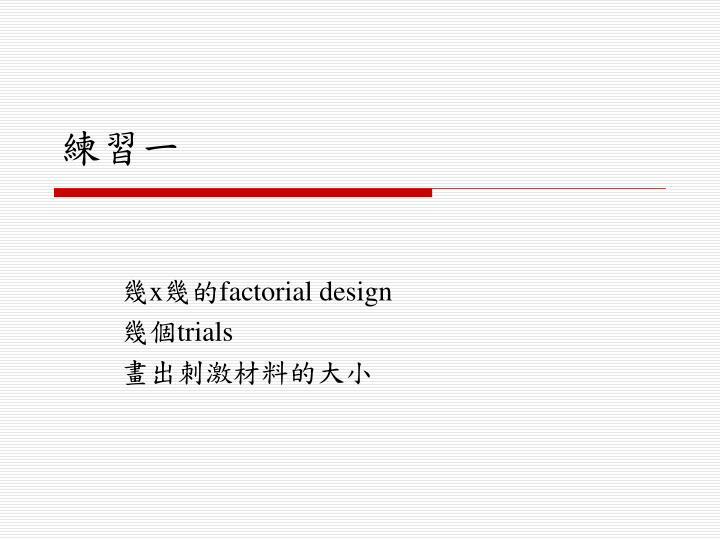 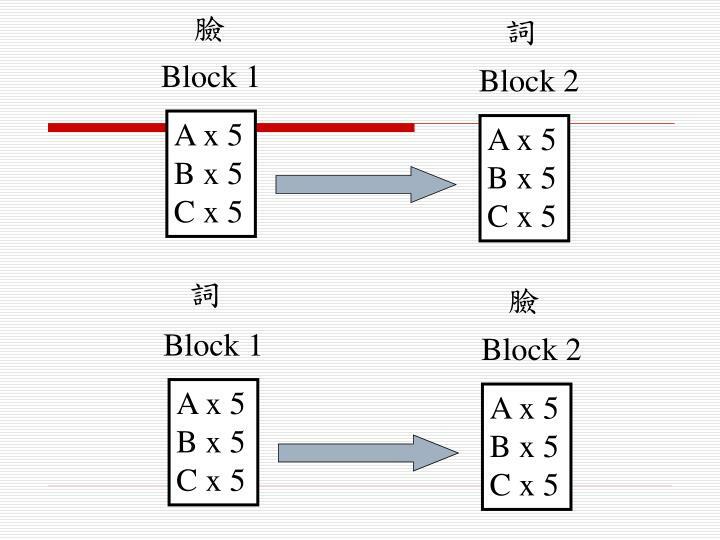 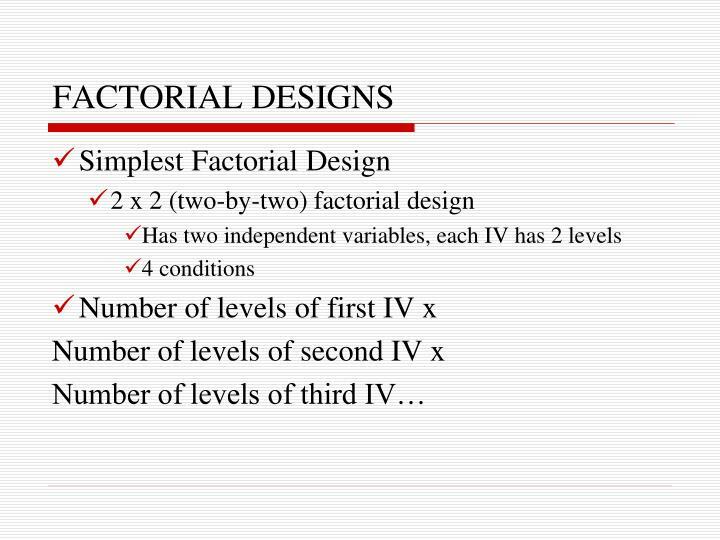 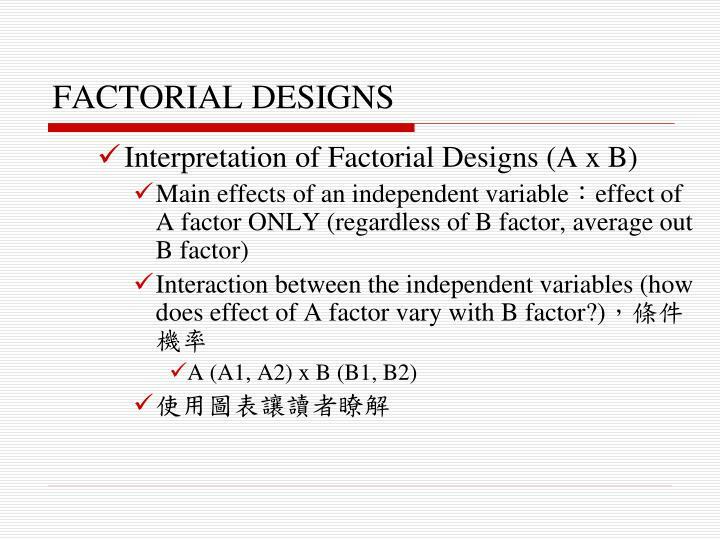 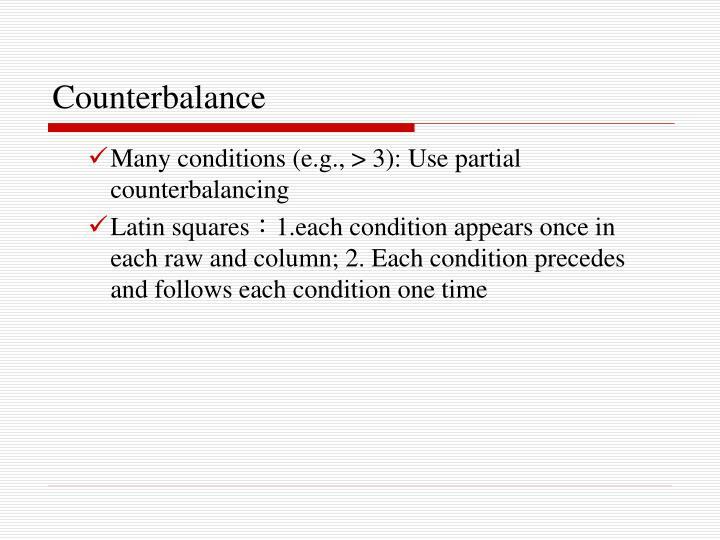 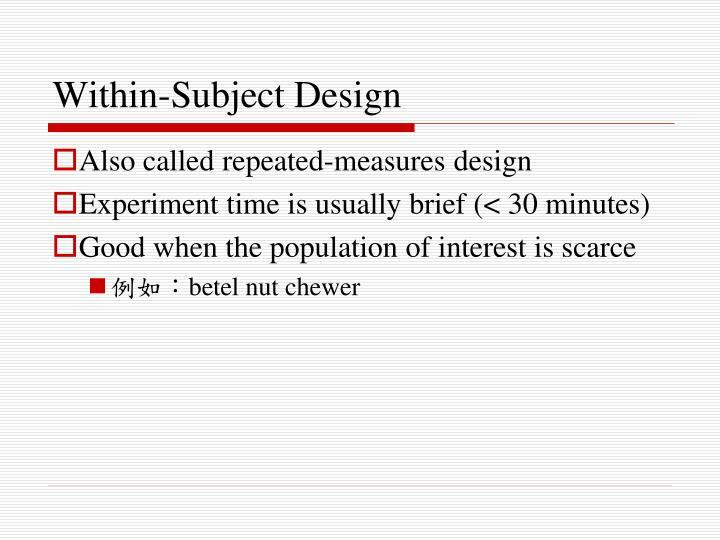 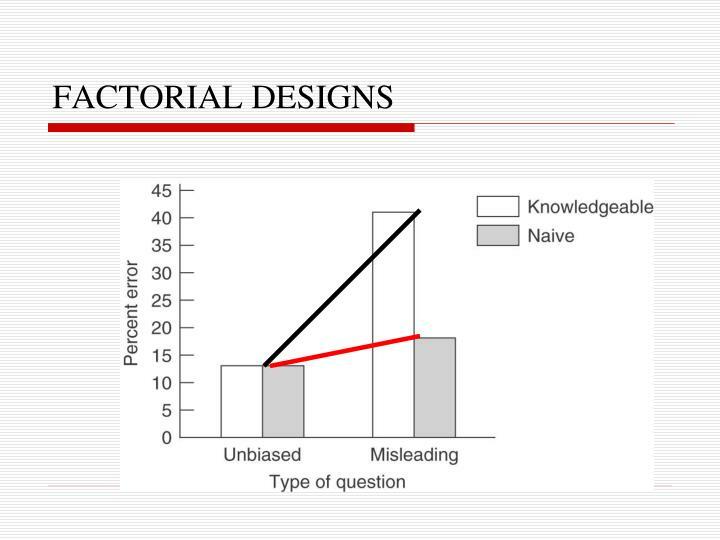 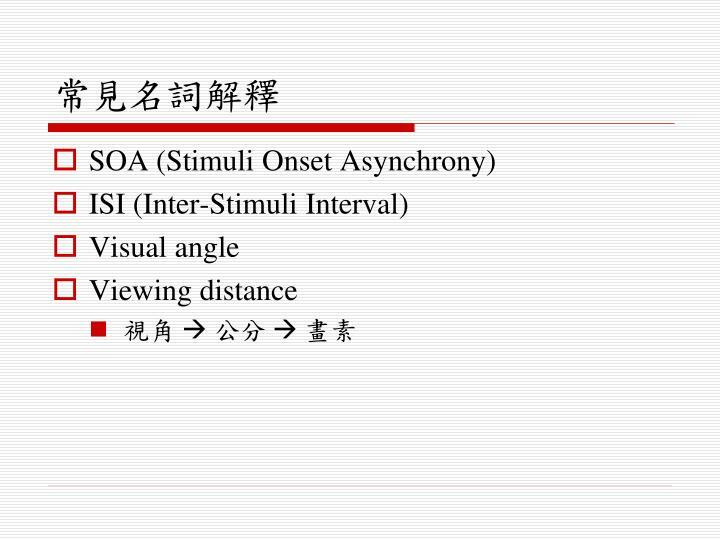 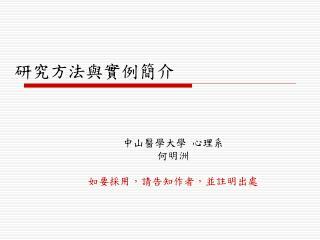 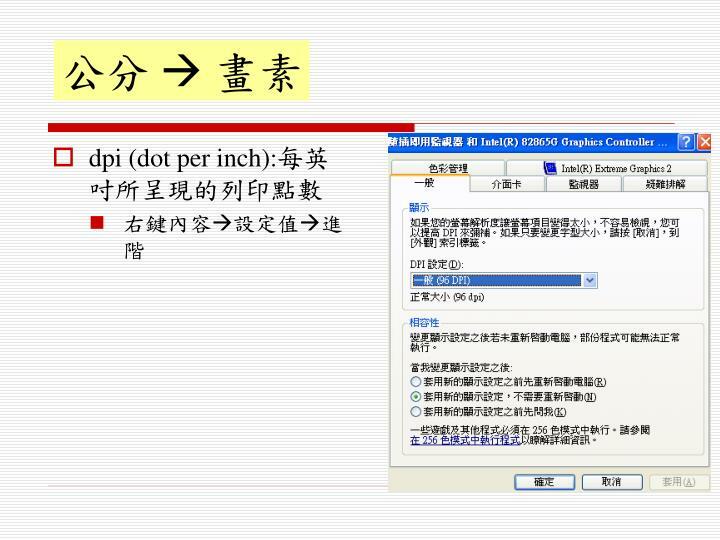 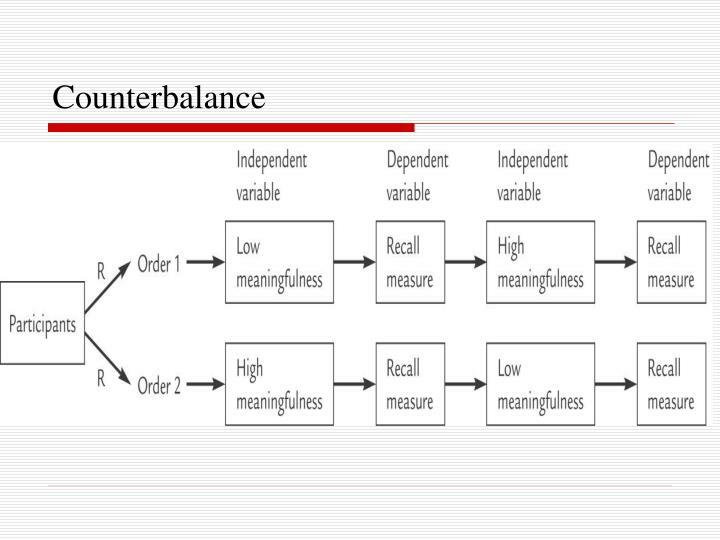 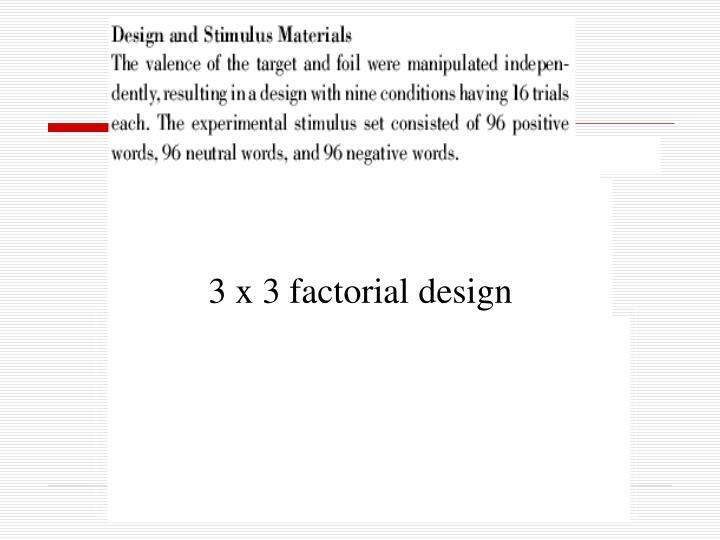 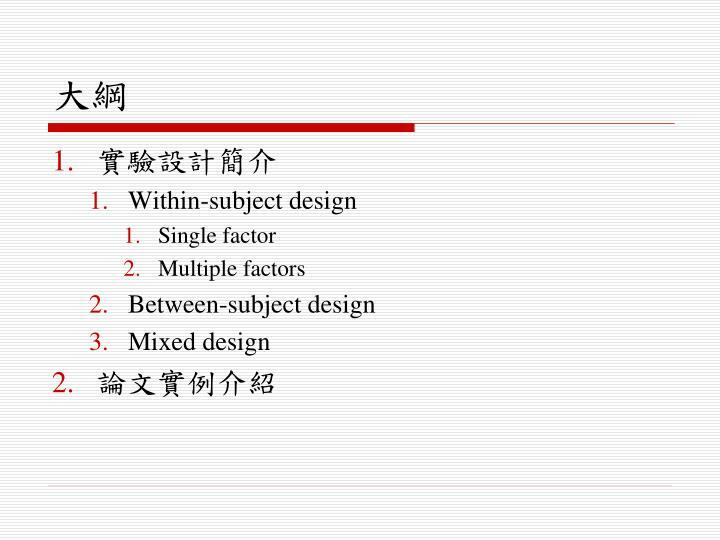 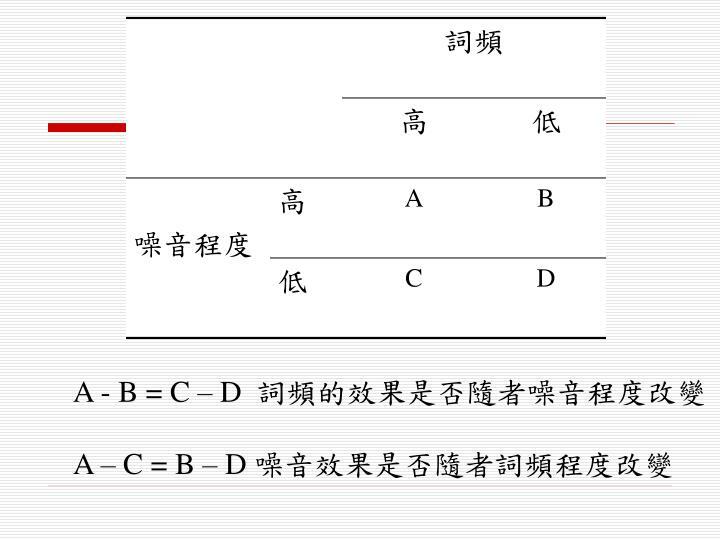 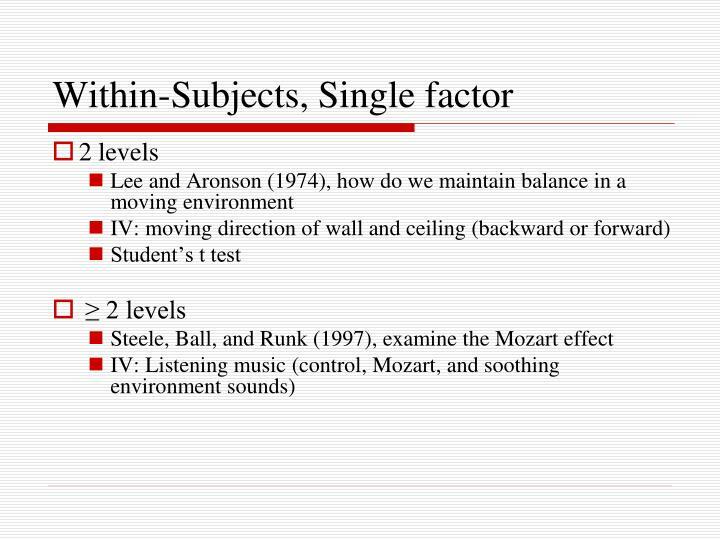 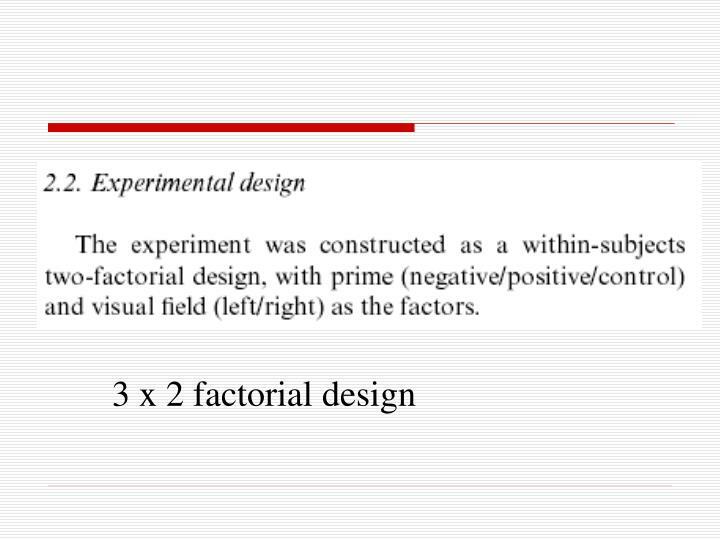 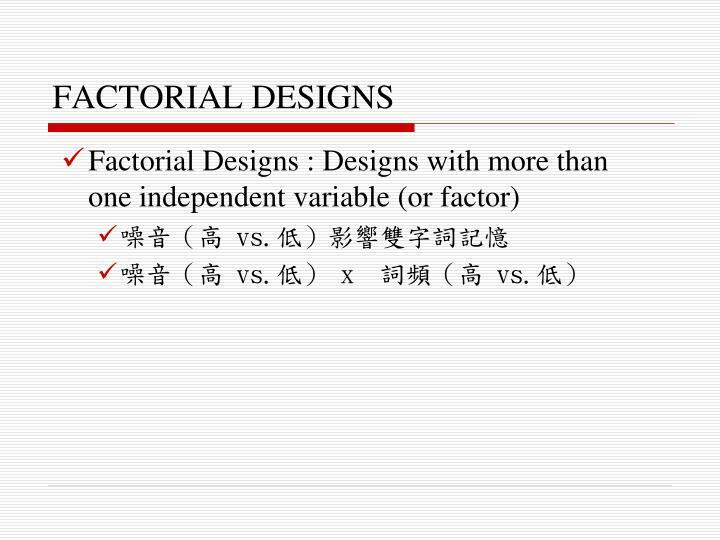 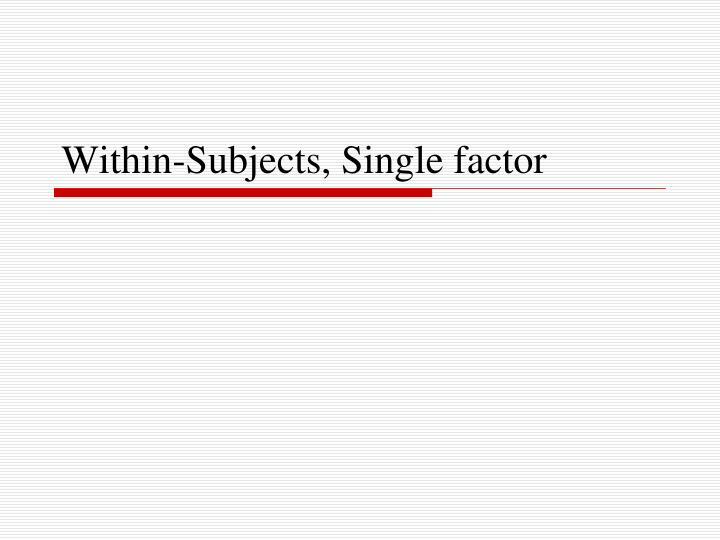 實驗設計簡介 Within-subject design Single factor Multiple factors Between-subject design Mixed design 論文實例介紹. 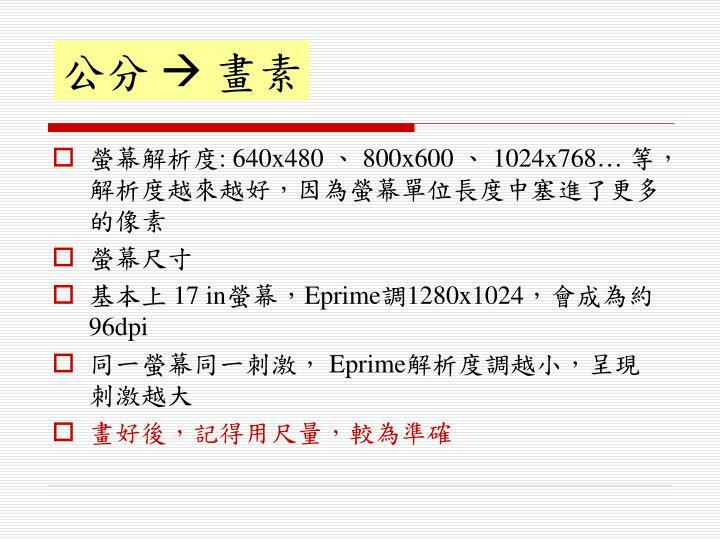 研究之初. 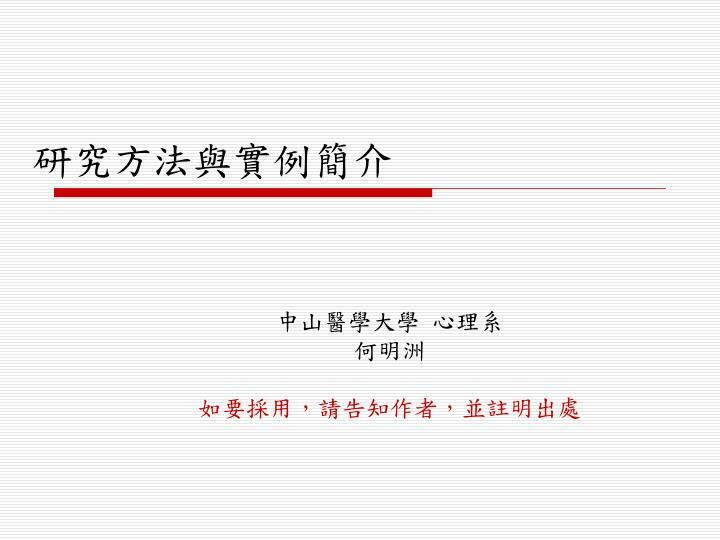 研究問題的建立與改變 同一個研究問題細分成許多不同的研究方向來檢驗此問題 不同的研究方向延伸出其他的研究問題 匯集而成的研究成果，逐漸建立理論 再由理論延伸出相關問題. 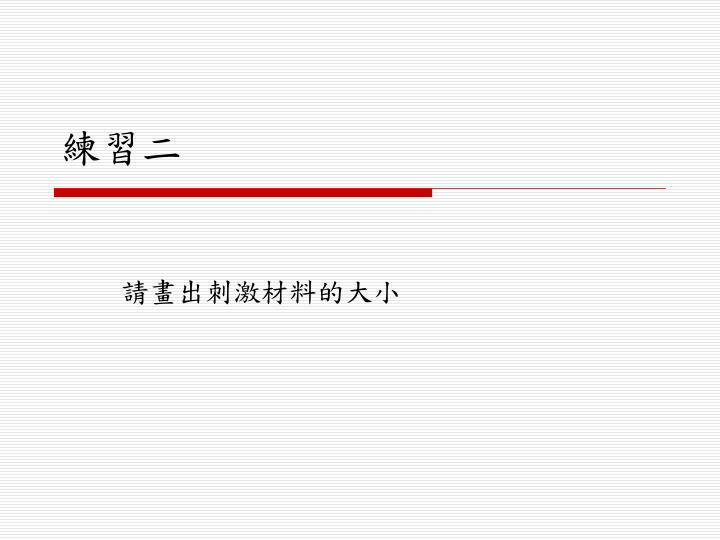 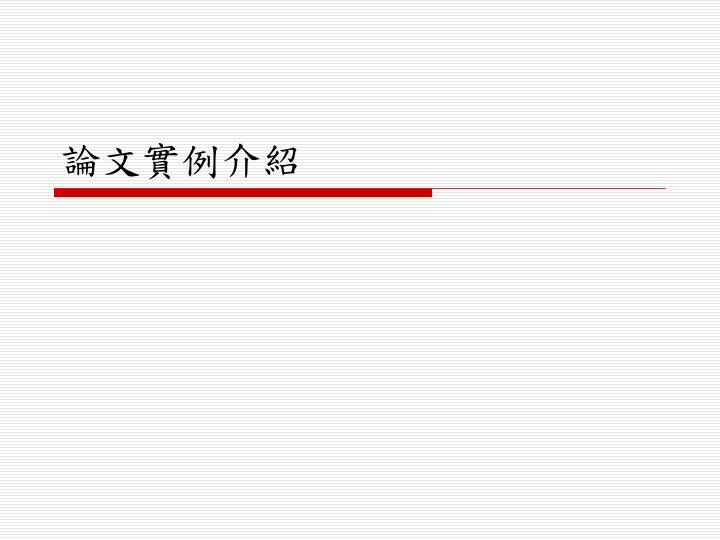 實驗設計簡介. 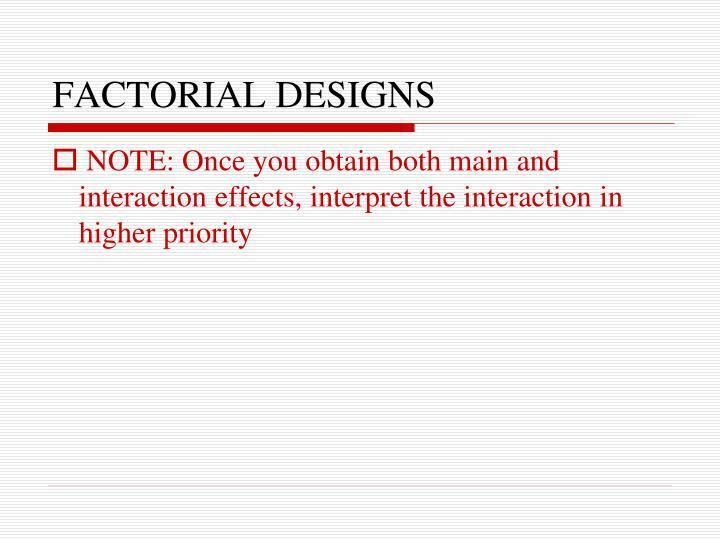 Within-Subject Design. 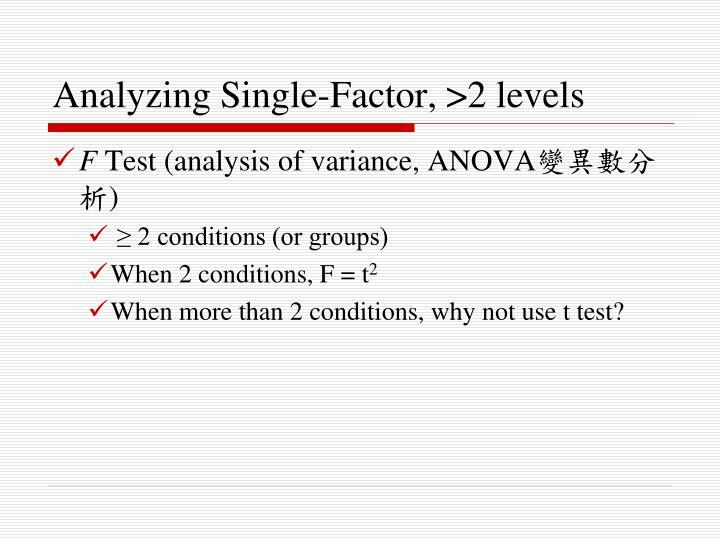 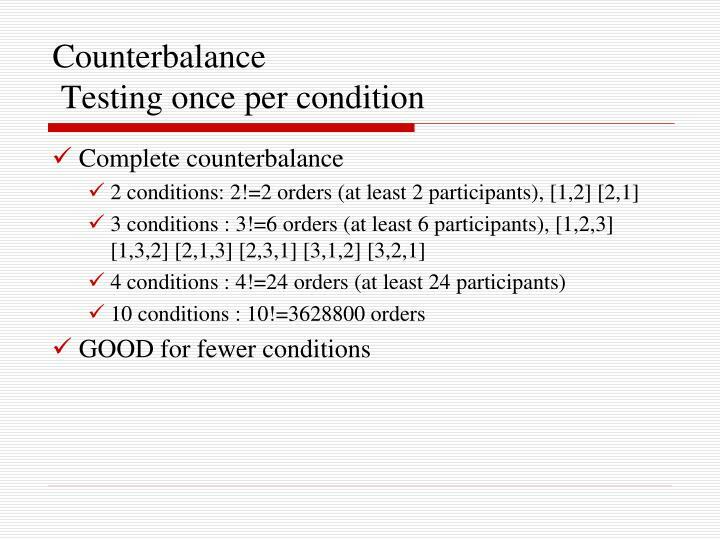 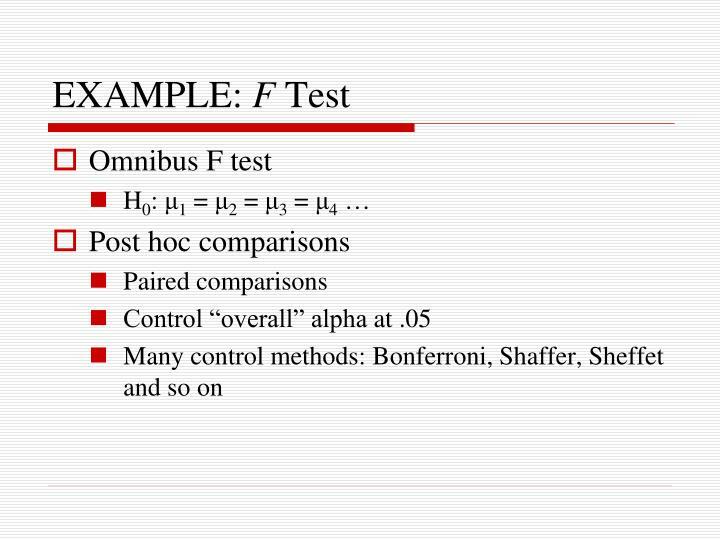 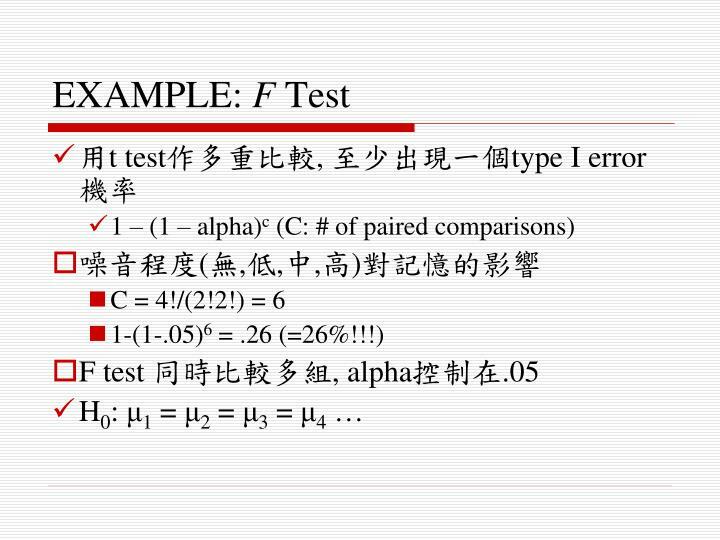 When more than 2 conditions, why not use t test? 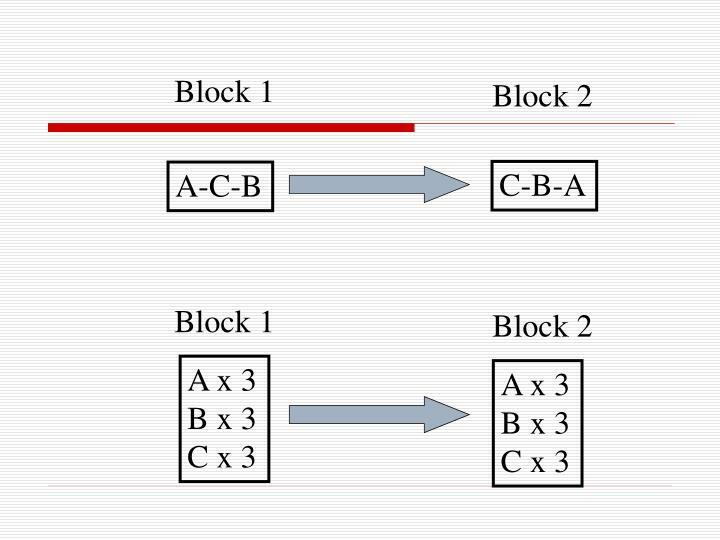 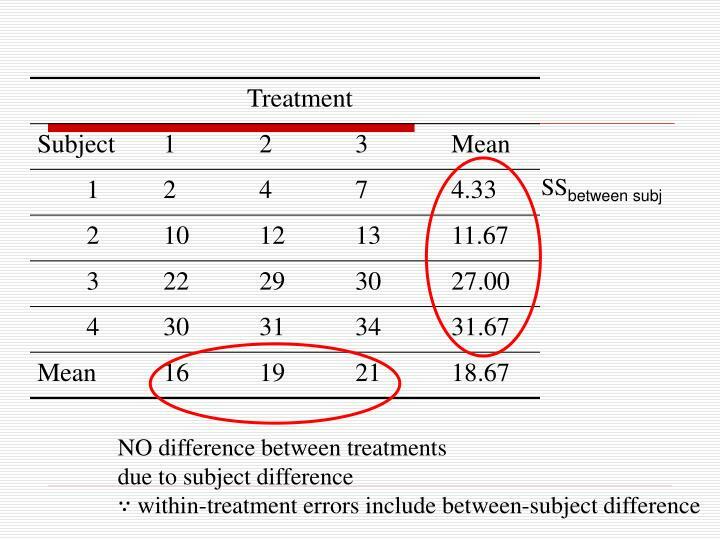 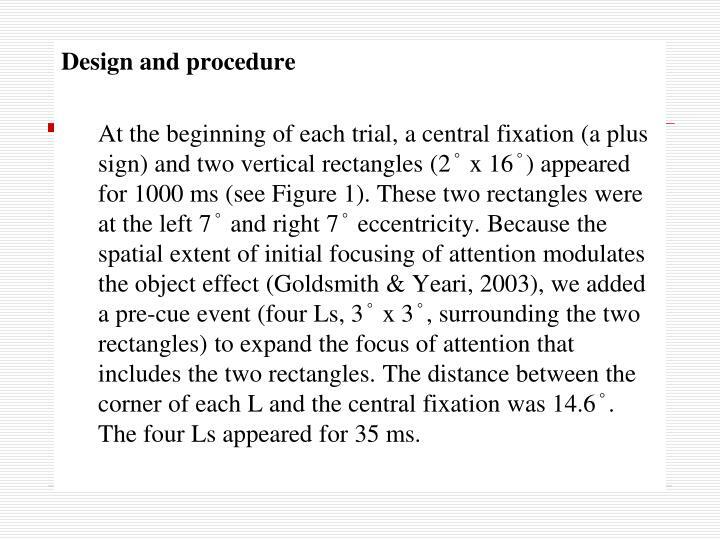 At the beginning of each trial, a central fixation (a plus sign) and two vertical rectangles (2° x 16°) appeared for 1000 ms (see Figure 1). 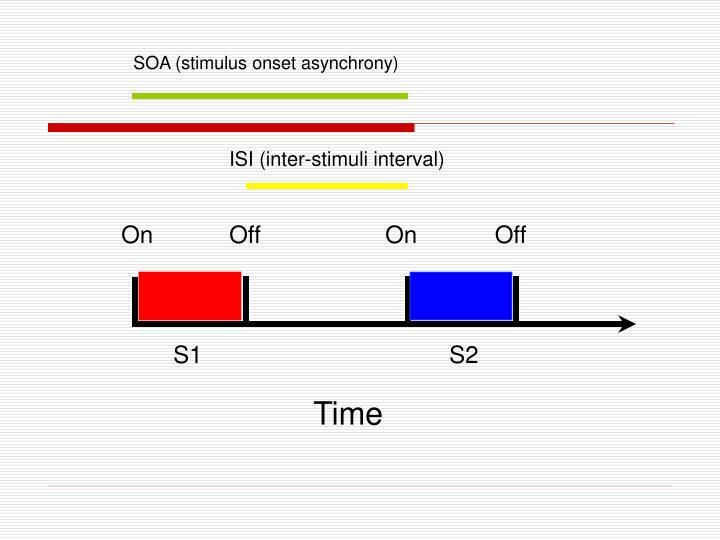 These two rectangles were at the left 7° and right 7° eccentricity. 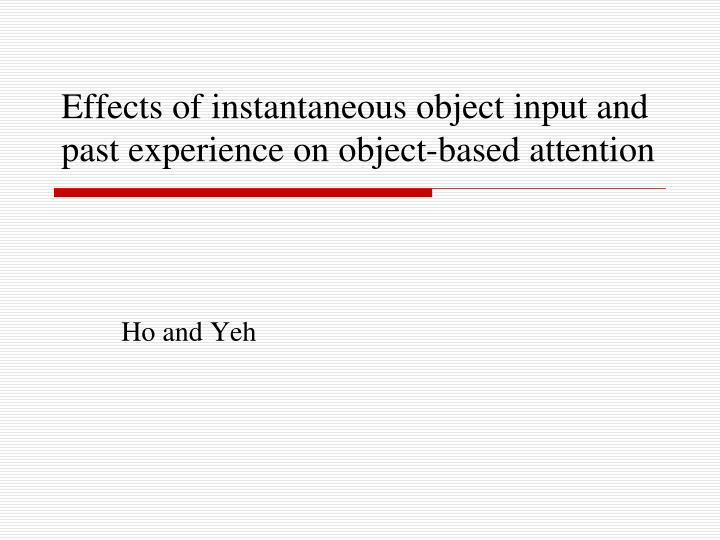 Because the spatial extent of initial focusing of attention modulates the object effect (Goldsmith & Yeari, 2003), we added a pre-cue event (four Ls, 3° x 3°, surrounding the two rectangles) to expand the focus of attention that includes the two rectangles. 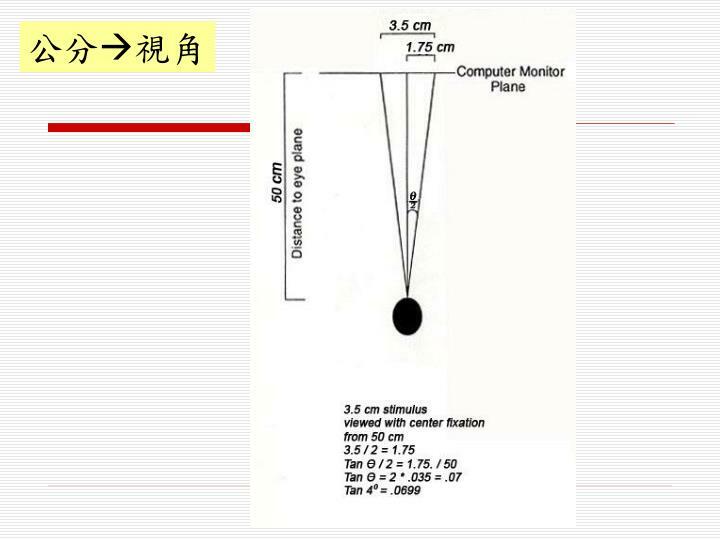 The distance between the corner of each L and the central fixation was 14.6°. 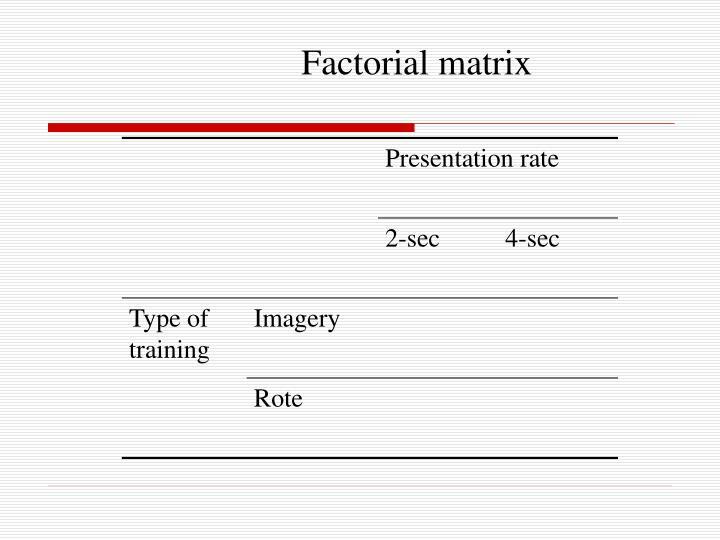 The four Ls appeared for 35 ms.
Seventy ms after the four-Ls offset, a red-colored cue (consisting of the object outline at one end of the object) was presented with 76% validity at one of the four ends of the two rectangles. 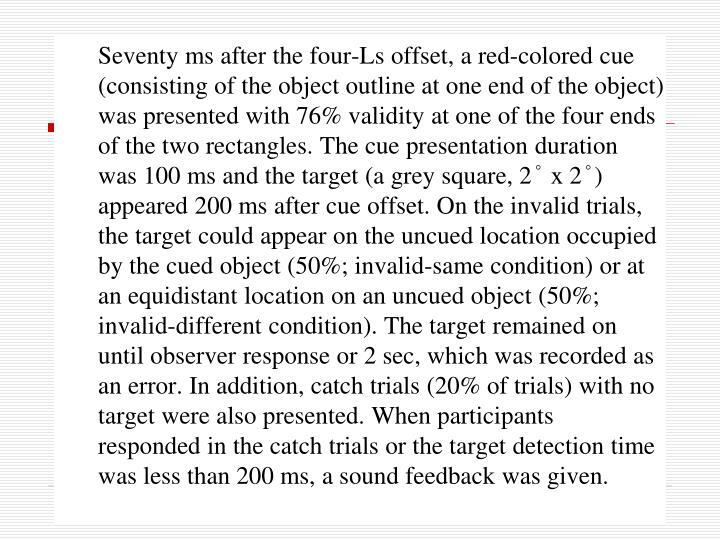 The cue presentation duration was 100 ms and the target (a grey square, 2° x 2°) appeared 200 ms after cue offset. 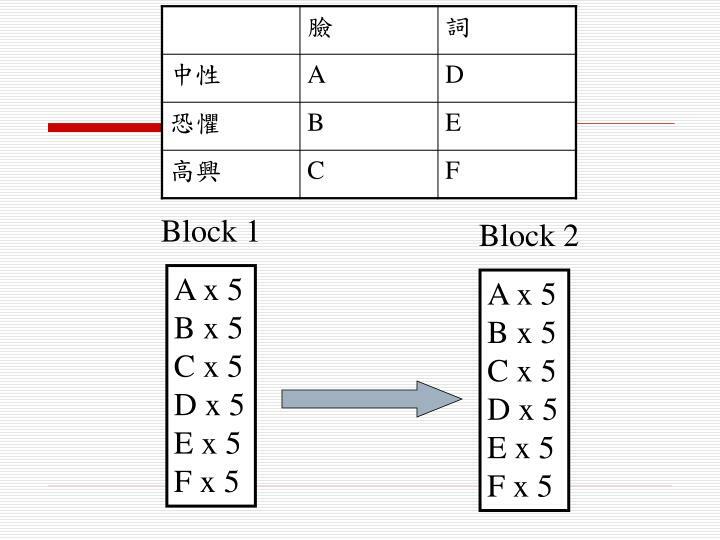 On the invalid trials, the target could appear on the uncued location occupied by the cued object (50%; invalid-same condition) or at an equidistant location on an uncued object (50%; invalid-different condition). 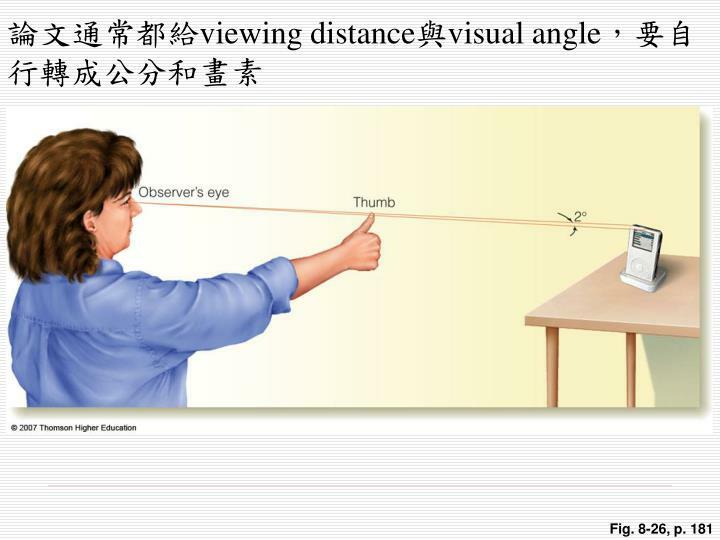 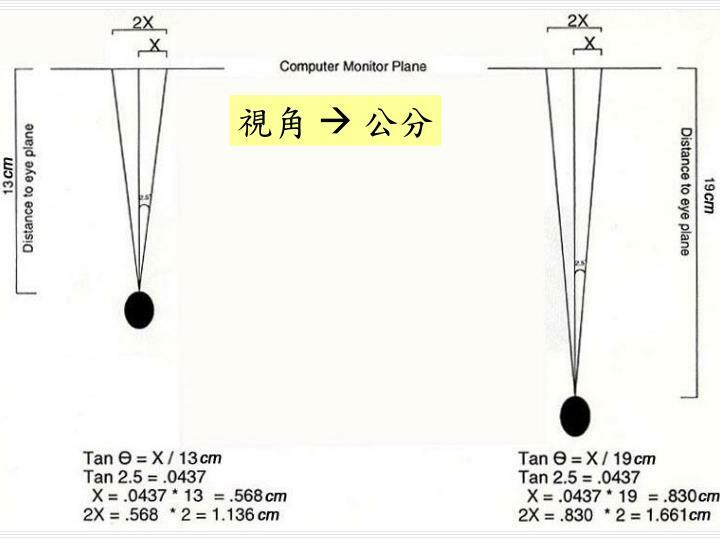 The target remained on until observer response or 2 sec, which was recorded as an error. 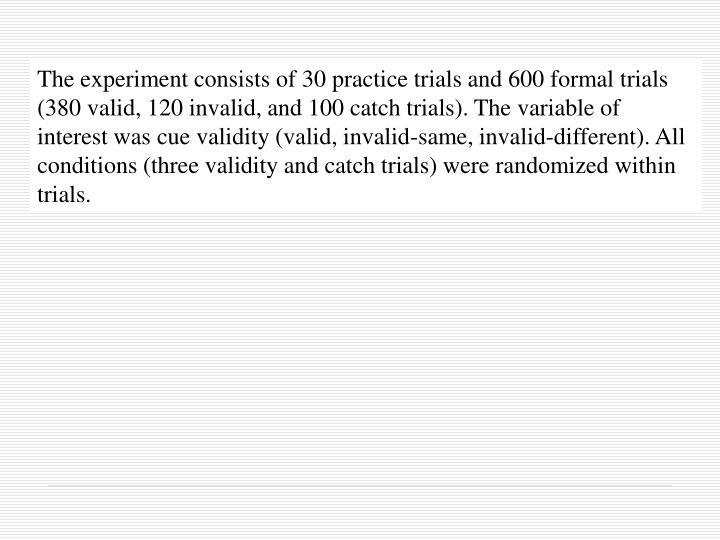 In addition, catch trials (20% of trials) with no target were also presented. 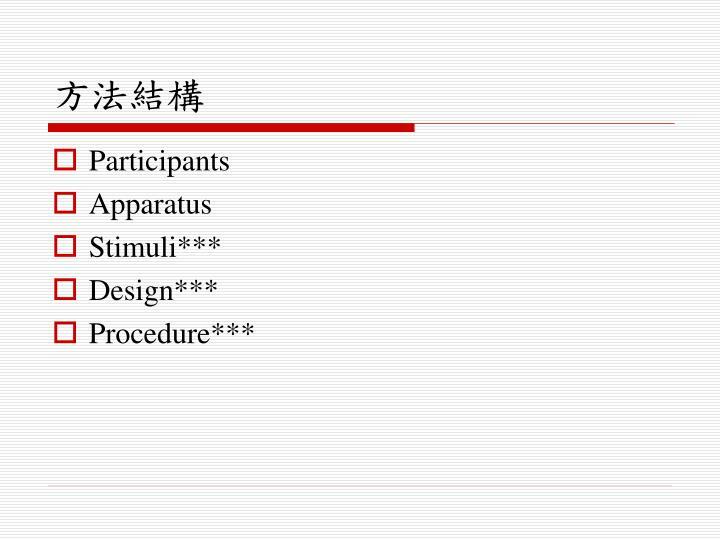 When participants responded in the catch trials or the target detection time was less than 200 ms, a sound feedback was given. 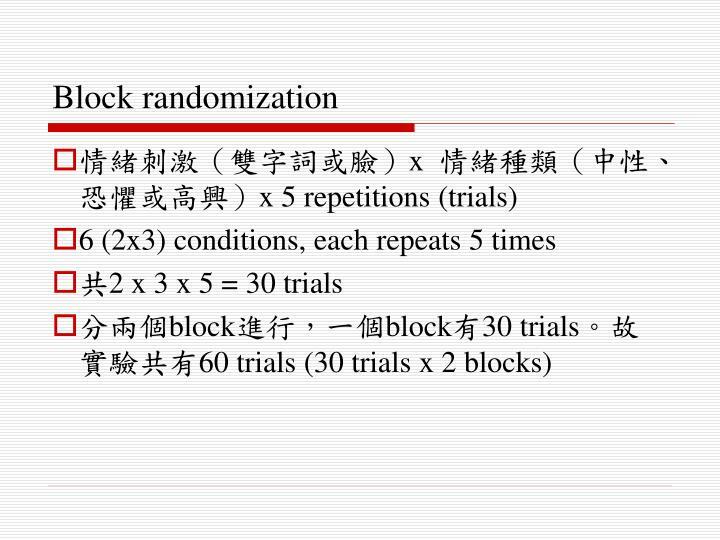 The experiment consists of 30 practice trials and 600 formal trials (380 valid, 120 invalid, and 100 catch trials). 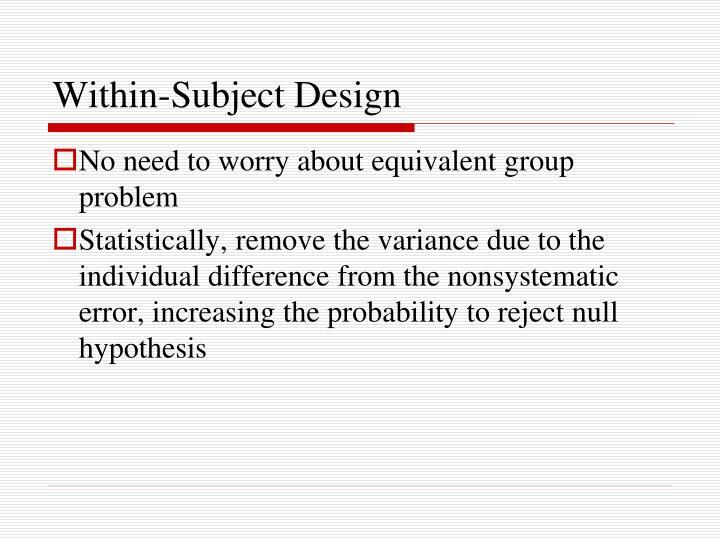 The variable of interest was cue validity (valid, invalid-same, invalid-different). 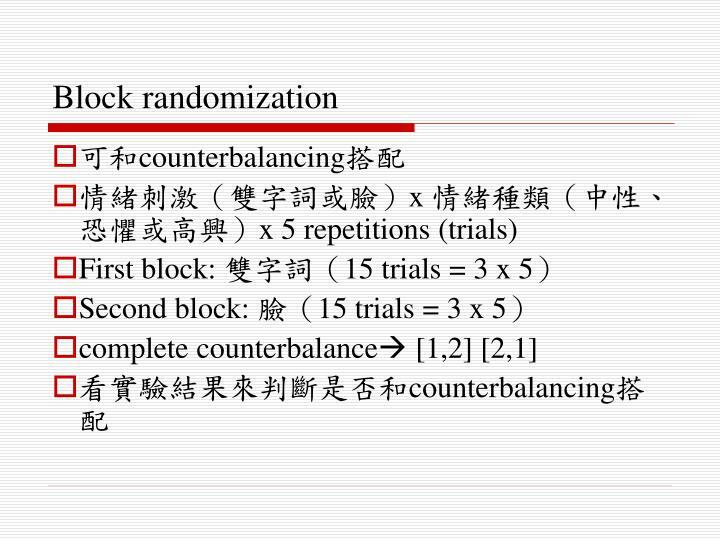 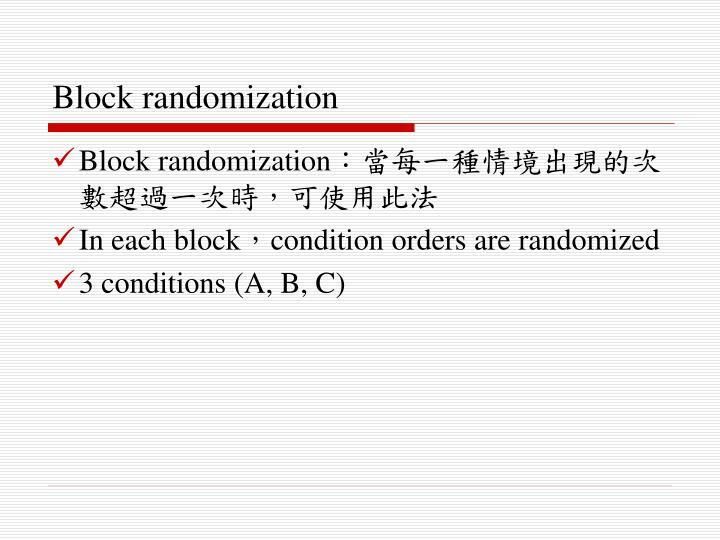 All conditions (three validity and catch trials) were randomized within trials. 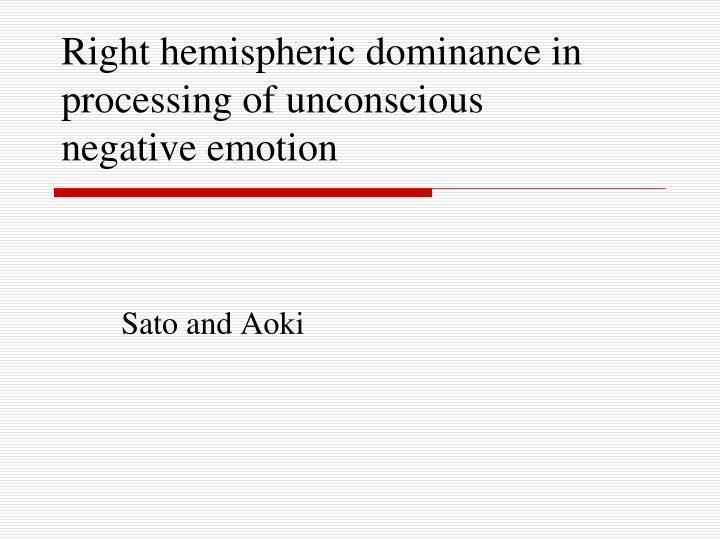 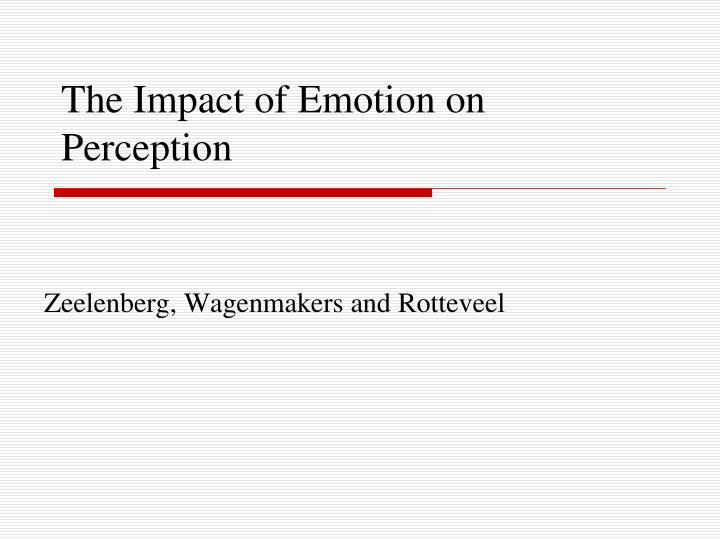 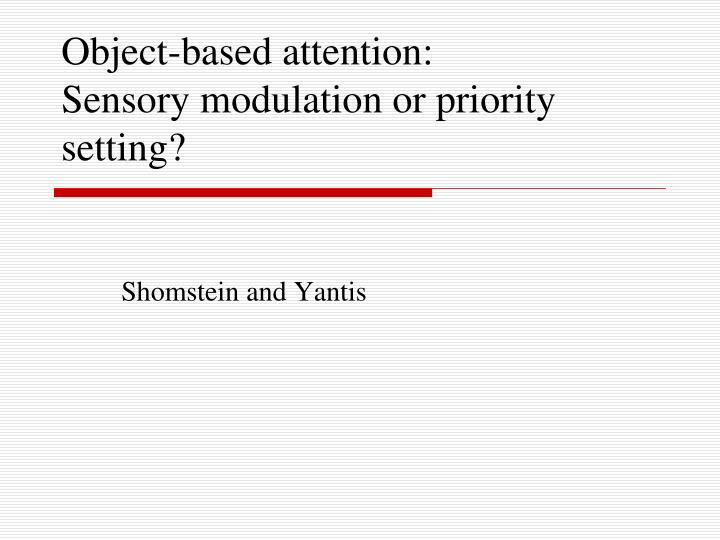 Object-based attention:Sensory modulation or priority setting?